Buy 1 for $32.59Buy 2 / Save $1.74!Buy 3 / Save $6.52! 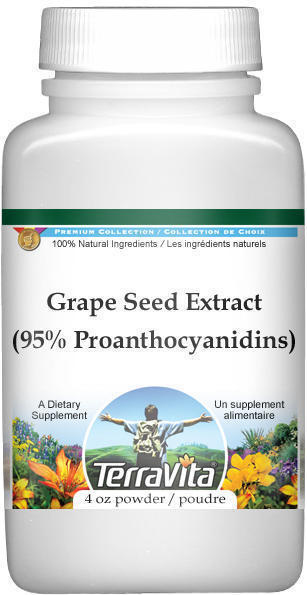 The oligomeric proanthocyanidins (OPCs) found in abundance in grape seed extract are potent antioxidants. Grape seed antioxidants may be as much as 50 times more potent than Vitamin E and 20 times more potent than Vitamin C. OPC flavonoids have shown valuable results in supporting the pain and inflammation resulting from microcirculatory disorders. They have been used to strengthen and repair connective tissue (including the cardiovascular system), to help support ophthalmologic problems and to help moderate allergic and inflammatory response by reducing histamine production. Balch,1997; BHMA Scientific Committee, 1996; Hallowell, 1994; Hoffman,1994; Tyler, 1993; Tyler, 1994; Wishard, 1995. Is your grape seed extract powder soluable in water or oil? Does it really dissolve or does it remain gritty? Yes! Our grape seed extract is very finely ground and is indeed soluble in water. It is extremely potent and, depending on the strength of the mix, is very bitter (bitterness is beneficial!) like grape seeds. You may need to stir the mix a fair bit due to the fact that small bits of powder love to stick to the sides of the glass or mug. A warm water mix would probably achieve the best results, but I have only tried it with cold water. The solution is not lumpy or gritty. I'm not sure how well it stays mixed or if the powder settles to the bottom; I usually drink it down quickly - it's not a delicious, sipping beverage. "Animal Study Shows Grape Seed Extract May Protect Brain." "Grape Seed Extract May Stop Arteries From Hardening." "Grape Seed Extract Blunts Hypertension." "Grape Seed Protects Heart Against Ischemia."